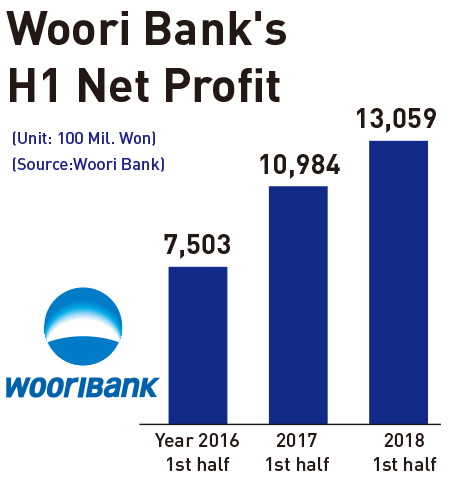 Woori Bank said its first-half net profit came to 1.305,9 trillion won, up 18.9 percent YoY, and the best half-year in 11 years, with second quarter net profit rising a whopping 55.32 percent at 716.2 billion won, the bank said on July 24. The quarterly net profit is the best since 2014 when the holding company system was discontinued, the bank said. The bank also attributed the surprising figures to the successful risk management, and the return of the loan loss provision in the first half that also contributed to the outstanding results. The bank said the NPL in the Q1 (0.52 percent) was downed to 0.28 percent in Q2 with the delinquency rate also down to 0.33 percent in Q2 from 0.37 percent in Q1. The normalization of operations at STX Engine and Kumho Tire also caused the return of the loan loss provisions to help the H1 performance results. Woori Card also had a very good H1 with its net profit up 9.1 percent from the preceding quarter at 61.9 billion won. Woori Bank now going through the holding company change is expected to get an enormous help from its H1 surprising results. Korea's three major banks are seeing contrasting outcomes in their investments in movies now showing. While Woori Bank is smiling with the rising popularity of "A Taxi Driver," Shinhan Bank and Industrial Bank of Korea (IBK) are grimacing with lower-than-expected ticket sales for "The Battleship Island." According to Woori Bank, Tuesday, the bank and venture capital firm Company K Partners have set up a fund to invest in Korean movies in March. For the 12 billion won($10.48 million) fund, Woori poured in 3 billion won and a number of large movie distributors also joined as partners. Including "A Taxi Driver," the fund has so far invested in six movies. It is seeking to plough up to 60 billion won into 100 Korean movies for the next four years. The movie needs 4.3 million viewers to break even. According to Korea Film Council(KOFIC), it drew 8 million viewers in less than two weeks after its release. Given that it is attracting about 700,000 viewers every day, the film has a shot at topping 10 million viewers in days to come. 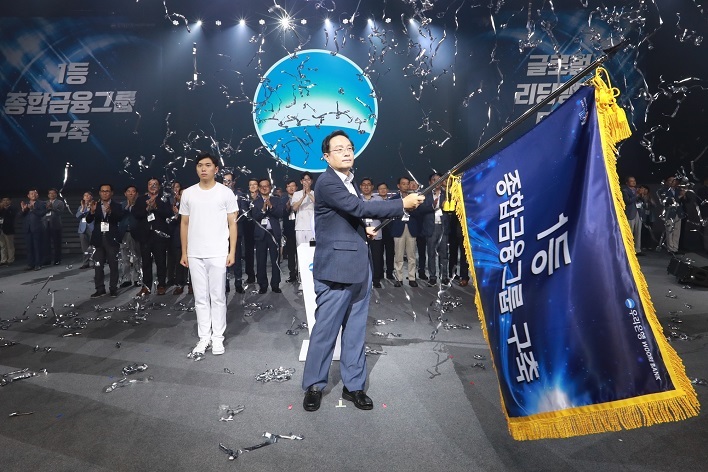 Initially, the fund sought an average 10 percent yield, but market watchers say the 10 million mark will bring up to a 70 percent yield to Woori Bank. The movie documented a taxi driver's journey taking German reporter Jurgen Hinzpeterinto Gwangju where a democratic uprising took place in 1980 asking for the end of military dictatorship. "From the perspective of banks, the investment may not be huge considering other deals. But box-office success of a movie not only brings profits but also promotes the brand image," a Woori official said. On the other hand, Shinhan Bank and IBK would be unhappy with the bitter box-office results of the highly anticipated film, "The Battleship Island." According to bank sources, Shinhan made a 5 billion won investment into a fund investing in cultural content. The fund has a good track record as it invested in a number of blockbuster movies but the choice on "The Battleship Island" might be a mistake. IBK has earmarked a 50 billion won budget for movie investments this year. Along with "The Battleship Island," IBK invested in "The King's Case Note," released in April, and "Along With The Gods," which will be released in December.Despite financial support from the two banks and 26 billion won in production costs, "The Battleship Island" is showing a shabby performance, after being mired in a series of controversies, including alleged distortion of historical facts to monopolization of screens. With its star-studded cast and plot on a sensitive historical issue, the movie was expected to draw more than 10 million viewers and got off to a solid start. But it lost steam during the second week after its release, posting around 6.5 million viewers in one week.